EXTEND YOUR COVERAGE TO EXTEND THE RIDE. Our Chrono Knee Warmers’ clean design moves freely with you, while nylon thread ensures a soft feel, and polyester content pulls moisture away from your skin. 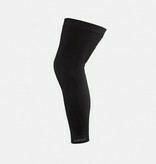 These knee warmers have enough stretch to allow freedom of movement, while staying comfortably in place on your body. Keep your knees covered to extend your ride even when the weather gets brisk.